In this article we’ll be installing an undertray/spoiler that dramatically and measurably improves underbonnet intercooler and radiator efficiency. No, you don’t need a wind tunnel like the one above - just a cheap measuring instrument, some cardboard and sticky tape, and your local roads. Last week Undertrays, Spoilers & Bonnet Vents, Part 1 we introduced the idea that before air can flow, a pressure difference is needed. So for example, before air will pass through an intercooler or radiator, there needs to be a higher pressure on one side than the other. Even if the pressure is high on the front face of the radiator or intercooler, if it’s also high on the back face, no air will flow through it. In short, air exits are just as important as air entrances. 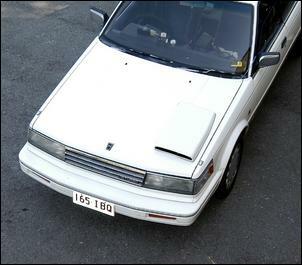 In Part 1 of this series we left you with the information that the measured pressure increase on the front face of the guinea pig Maxima V6 Turbo’s underbonnet intercooler (air channelled to it by a bonnet scoop) was pretty well matched with the air pressure in the engine bay... which is where the intercooler air exit is. The whole desire to make some aerodynamic changes to the front of the car came about because when doing some other road testing, I’d had the standard undertray off the car. This design is in two small pieces, with one section hanging down low at the rear. I’d already found that when this undertray was tied upwards, the measured intake air temp rose as intercooler efficiency dropped (see Driving Emotion). But with the undertray removed completely, the performance of the intercooler and radiator seemed to go even further backwards. The first measurements were taken with the standard undertray configuration, as shown in the pic above. As the table below shows, the pressure build-up in the engine bay at 80 km/h was 0.4 inches of water. 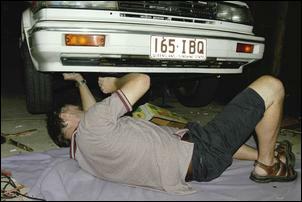 The short factory undertrays were then removed, leaving an opening that allowed the road to be seen by peering down between the radiator and the engine. The table below shows the measurements that were taken. As can be seen, the pressure at the rear of the engine bay stayed the same at 0.4 inches but the pressure at the front of the engine bay (which is where the intercooler is mounted) rose to 0.5 inches of water. This explained why the rad and ‘cooler didn’t work as well with the small undertrays removed. A test undertray was then fabricated from some plastic sheet that had once backed an advertising hoarding. The front of the trial undertray was held in place with cable ties connecting to the lower edge of the bumper and at the rear, by a wire that connected it to the anti-roll bar. 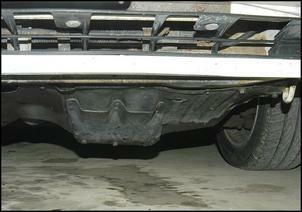 The undertray was allowed to droop down at the rear, creating a gap that reached about 10cm in the middle. This photo shows the test undertray in place. The measurements taken with this undertray are shown in the table below. As can be seen, the pressures found towards the front of the engine bay are markedly altered by the presence and shape of the front undertray. 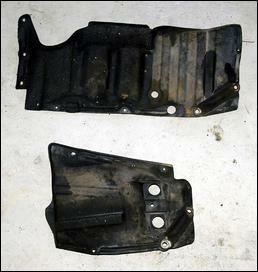 Over having no undertray at all, the trial plastic undertray reduced the pressure in the front part of the engine bay by 40 per cent. Significantly, it was also much better than the standard undertrays, reducing the pressure build-up over them by 25 per cent. 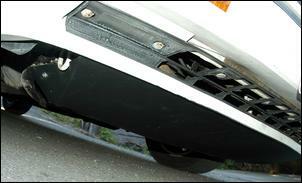 Next a spoiler lip was added to the undertray. The trial lip was formed from foam rubber and was 5 x 5cm, being attached to the undertray 15cm back from the leading edge. The measured results are shown in the table and graph below. Over the new undertray alone, the lip made no difference to the recorded pressure at the front of the engine bay but had a dramatic effect on the rear pressure – dropping it by 25 per cent. So compared with standard, the new trial undertray and spoiler lip decreased the front and rear pressure engine bay build-ups by 25 per cent. Over having no undertray at all, the new combo dropped the front and rear underbonnet pressures by 25 per cent and 40 per cent, respectively. This major pressure drop (improving airflow through all the front-mounted heat exchangers) is especially important to consider if your car has no undertray. Why They Worked – Maybe! Measuring that in fact these trial designs did work is far better than any theory – but what is likely to have been going on? Firstly, the absence of any undertrays probably created turbulence under the engine bay. Despite turbulence often being characterised as ‘low pressure’ it can have the effect of preventing other airflows smoothly joining it. By having a relatively smooth undertray hanging down at the rear, air is accelerated between the undertray and the road, better drawing air out of the engine bay at the trailing rear edge of the undertray. And the spoiler? 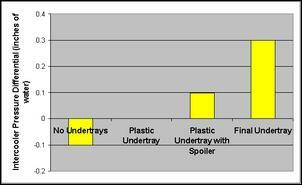 Like nearly everything in car aerodynamics, this partly contradicts what was just said – the spoiler is likely to have created a slightly lower pressure behind it, either by changing the effective shape of the undertray or by causing localised high speed turbulence. The measurements taken so far were referenced against cabin pressure – with the windows open, effectively the same as ambient. However, because I wanted to achieve a specific outcome (better airflow through the radiator and especially the intercooler) I decided to do some more measurements. These were to be true differential measurements – that is, carried out by running two sensing tubes from the measuring instrument to either side of the intercooler and then measuring the actual pressure difference across the core. And what an eye-opener these measurements were! 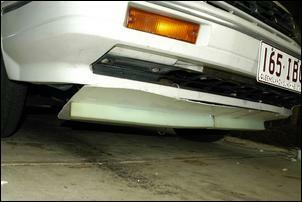 Remember, the higher the pressure difference across the intercooler, the more air that will be flowing through it. The table above and this graph show that without any undertrays in place, the air from under the bonnet is likely to have been flowing out through the bonnet scoop! That is, there was a measured higher pressure under the intercooler than on top, even at 80 km/h! No bloody wonder intake air temps went up in this configuration – the air was coming in through the radiator, being heated, then passing through the intercooler and out the forward-facing bonnet scoop! With my mock-up plastic undertray in place, the pressure at 80 km/h was the same top and bottom of the intercooler. That is, no airflow through the core would have been occurring. And with the trial plastic undertray and the foam rubber spoiler, I had a very small positive differential of 0.1 inches – the pressure was a little higher on top than underneath. This was serious food for thought. When the intercooler fan is off, the flow through the intercooler core is lousy – sometimes backwards, even. I then made a cardboard undertray that I fitted under the intercooler side of the engine bay. I replicated the foam rubber spoiler with more cardboard, then went for a drive. The resulting pressure differential was zero... unless I was in the turbulent wake of another car, where it was 0.1 inches! Yes, incredible as it sounds, the intercooler airflow was clearly being affected by other vehicles – in this case, when following another vehicle, it got better. This was all getting seriously involved, so rather than spend more time on mock-ups, I decided to start work on the real thing. By far the easiest way of assessing aero changes is to make quick and easy mock-ups of proposed undertray shapes out of cardboard and/or sheet plastic, cable ties and sticky tape. It might attract some interested looks from passers-by, but in five minutes of on-road pressure testing you can prove or disprove a design. Not mentioned in the main text is another front-end shape that was trialled – a straight up/down spoiler so low that it scraped on the ground. Despite preventing lots of airflow under the car, the pressure differential across the intercooler remained at zero. So this quickly showed that there was no point in going for a deep front spoiler - it didn’t work. I won’t take you through every design iteration made with the ABS, but after hours of constructing and testing, constructing and testing, I struck gold. 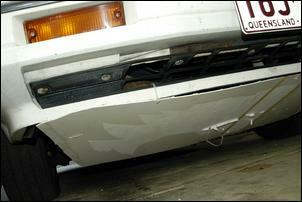 With the short undertray configured as shown here (flush with the lower bumper at the front, angled slightly downwards and open at the rear, and with the sides sealed-off with angled folded panels), the measured pressure differential across the intercooler skyrocketed to 0.3 inches of water at 80 km/h. In the above table and on this graph you can see what an incredible change that is – no less than a 400 per cent improvement over having no undertray at all! Over the worse-case scenario (ie no undertrays) the intake cruise air temp on a 30 degree C day also dropped from 65 to 47 degrees C.... Yes, the intercooler was now working – even without the fan on! 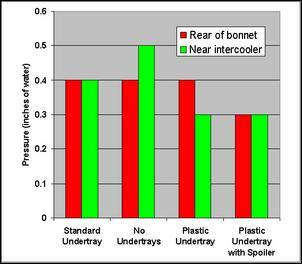 So could the pressure difference be improved even further with the addition of a spoiler? The answer was ‘no’. 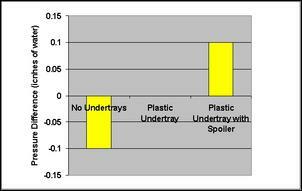 Despite trialling lip spoilers in different positions and of different heights on the undertray, no significant gain in pressure across the intercooler could be made with this version of the undertray. 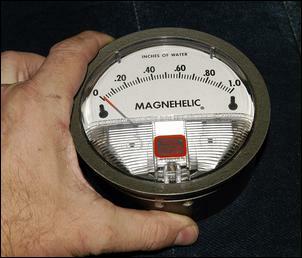 And what about underbonnet pressures – the starting point of the measuring process? This series is entitled ‘Undertrays, Spoilers & Bonnet Vents’ but there isn’t going to be a front spoiler. As indicated above, several versions were trialled but they were not effective at increasing the pressure difference across the intercooler, while at the same time they reduced ground clearance. However, the simple undertray (well, simple now that all the work has been done!) makes a radical difference to the airflow passing through the intercooler – an increase in airflow that measurably drops cruise intake air temps. In addition, it is noticeable that the radiator fans (being monitored by a LED inside the cabin) don’t operate nearly as often as previously – basically, if the car is moving on the flat, the fans stay off, whatever the outside temp. IOTW, the radiator is now working much better. Playing with different undertrays and front spoilers can result in significantly increased intercooler (and radiator) efficiencies. However, if you’re not measuring actual aerodynamic pressures, you’re working in the dark – even apparently minor changes in design can yield major changes in aerodynamic flows.